And how the ‘boilermaker’ cocktail is having a bit of a moment. FORGET OUR GREEN fields and hospitality. The two real most important things Ireland is known for? Whiskey and beer, of course. So why did these two drinks – rather than, say, any other beverages – become part of Ireland’s identity abroad? And what links the pint and the chaser? Well, quite a lot as it turns out. There’s a potentially simple reason for whiskey and a pint going hand in hand, of course, and that’s the tendency for distilleries and breweries to be in close proximity. The two drinks share ingredients (malted grain, yeast and water) and even the process involved is similar up until the first few days of processing. For this reason, areas in the world that have access to these elements tend to produce both – Ireland being a classic example. Here, the first whiskey was produced when Celtic monks distilled their beer to make stronger spirits (naming the results ‘water of life’ – aqua vitae in their Latin records, or uisce beatha in Irish, hence our word ‘whiskey’). Even some of the brands that still exist today began with beer. The Daly family in Offaly, owners of the distillery that became Tullamore D.E.W., brewed local beers alongside their spirits. What’s the history of the industry here? Ireland has been internationally known as a producer of beer for at least two centuries, but the history of whiskey in this country is a little more complicated. However, the middle part of the last century dealt a series of blows to the industry. The Civil War, followed immediately by Prohibition in the US and a trade war with Britain, ruled out key export markets and many producers closed down. It is only in recent decades that the whiskey industry has seen a resurgence – followed closely by the newfound enthusiasm for local craft beer. When everything is mass produced and everything needs to be made in super quick time, there is a great appreciation for something that takes its time to be fully appreciated. Customers at home and abroad are conscious of the craftsmanship that goes into making a great product such as whiskey. So did people drink beer and whiskey together? A true “boilermaker” is a craftsman who produces things from steel plates and sections, anything from boilers to blast furnaces to bridges. So how did it come to mean a pint and a chaser? One simple explanation is that it comes from men in the time of the Industrial Revolution building locomotives, who needed a bit of extra juice at the end of a back-breaking working day. One other folk tale describes Richard Trevitchik of Cornwall testing his design for a steam engine on Christmas Eve in 1801, when he accidentally set his vehicle on fire after toasting its success. The incident was blamed on his double tipple of choice… Well, we’ve all tried that excuse, Richard. And do they combine well? Well, the boilermaker is currently enjoying something of a moment. Idlewild has an entire boilermaker menu, with an extensive list of paired beers and whiskeys to choose from. Keith credits this renewed popularity to the drink’s venerable history, combined with a consumer interest in exploring different drinks. The old movies you would see a guy coming into the bar and ordering a beer with a whiskey chaser. They made it cool by upping their game and starting adding whiskey cocktails as a chaser, and using other spirits that complimented a beer. Enhancing the tasting notes that the beer brings by sipping on the subtle flavours that the whiskey brings to your palate. The tasting notes from the caramel in the whiskey, go brilliantly with the dark coffee flavours of some of our beers. It’s a toast to the craft makers of said whiskey and beer that we put time and effort into the drinks complementing each other. Perhaps it’s not surprising, given the common ingredients and origins of beer and whiskey, that they should compliment each other. But Keith argues that their menu also encourages a more varied taste experience. “When we set out to have Ireland’s first boilermaker menu, it was targeted to people who drink beer or whiskey, but because of prices being high, would never order both,” he says. Well, you won’t catch any Irish person arguing with that any time soon. Ours is a boilermaker if you’re heading up! Know any more facts about these tried and tested Irish specialities? Let us know in the comments… We’re all ears. One whiskey embracing the boilermaker trend is Tullamore D.E.W. with its signature serve of D.E.W. and a Brew. Tullamore D.E.W. is a legendary triple distilled, triple blend Irish whiskey, known the world over for its smooth and gentle complexity – and it features on the Idlewild boilermaker menu. Find out more about how best to mix up a Tullamore D.E.W. drink at tullamoredew.com. 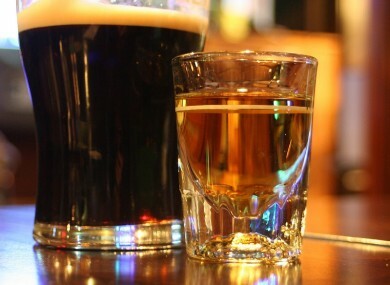 Email “How beer and whiskey became Irish specialities”. Feedback on “How beer and whiskey became Irish specialities”.